A full day of sightseeing in Warsaw. 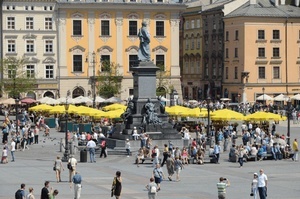 We will visit Old Town, rebuilt after World War II, site of the historic Jewish Ghetto area. We continue to the heart of vibrant downtown before driving along the elegant Royal Route to the Palace on the Water, one of Europe's finest 18th-century royal residences, in the Lazienki Gardens. Lunch on your own. In the afternoon, we visit the Museum of the Warsaw Uprising, one of the best museums in Poland, dedicated to the 1944 uprising. You can omit the Museum visit if you like, and take some free time to explore Old Town and the details of the building restoration on your own. After breakfast, we depart for the Baltic Sea, heading north through the Warmia region to the Ostroda-Elblag Canal in the Ilawa Lake District. We will board a canal boat and cruises north on a system of canals combined with the narrow-gauge railway, built by Germans in the 19th century. In the afternoon, we will tour Malbork Castle, one of the largest medieval castles in Europe, and the seat of the mighty Order of Teutonic Knights between 1309 and 1459. The great halls and the magnificent high tower have been meticulously restored, it even has a central heating system, and the building is now a UNESCO World Heritage Site. We start in th Old Town of Gdansk, Gdańsk’s past as the richest Polish port city has made it one of the top tourist destinations in Poland. Its Old Town is full of maritime atmosphere and packed with unique Hanseatic-style architecture. Think Amsterdam; tall and slim red-brick waterfront houses. During sightseeing you will see the Old Town, St. Mary’s (the largest Gothic church in Poland), the Neptune Fountain and the Artus Court. After, we take you to Oliwa with a beautiful 13th-century cathedral famous for its set of incredibly complex pipe-organs. After an organ recital, you will have free time in Gdańsk. Afternoon. On the way to the Old Town, we stop at the famous Gdansk (formerly Lenin) Shipyards, the birthplace of the Solidarity movement led by Lech Walesa. In the morning, we will stop in Gniezno, the first Polish capital, on the way to Wroclaw (Breslau). Gniezno is a must-see to understand the early history of Poland. The cathedral was the coronation site of five Polish kings. It is well known for its bronze Romanesque gate. The tomb of Saint Wojciech (Adalbert) is the centerpiece of the cathedral. The tour today will be a very different kind of experience. We will visit two former Nazi death camps outside the town of Oswiecim in eastern Silesia that make up the Holocaust Memorial, the older camp Auschwitz I (the museum) and Birkenau II, the vast area of the former work and extermination camp. The memorial is there to remind all of us of one of the worst periods in our history. After lunch we continue south to Zakopane, the principal Polish mountain resort located at the foot of the majestic Carpathian mountain range. In the evening, we take a horse carriage ride to one of the best local restaurants. Enjoy a lively highlander show with live music and dance where you will see the folk customs that are still thriving in this region, and get a taste of the local cuisine and the strong “highlander tea”. This morning we pay a visit the Wieliczka Salt Mines, descending into the unforgettable underground tourist attraction with grottos, chambers, and chapels carved from rock and salt deposits. There is nothing like it anywhere in the world. We will explore the Main Town Square, the largest town square in Europe, with churches of different architectural styles, and beautiful streets brimming with old world charm. We will visit the Church of the Virgin Mary and witness the magical moment when the world's largest wooden altar (carved by Wit Stwosz between 1477 and 1489) opens its wings, a daily event. We will also be able to hear the haunting alarm-call, the Hejnal, played by a trumpeter from one of its twin towers on the hour, every hour. After breakfast, we will visit Częstochowa, the last highlight of our tour. The Jasna Góra (Bright Hill) Monastery of Częstochowa belongs to the most important and inspiring pilgrimage points in Christendom, along with Rome, Lourdes in France and Fatima in Portugal. Led by a resident Pauline Monk, we will see the famous Black Madonna and the monastery premises. We will arrive in Warsaw in the early evening and can drop you off at the Chopin Airport, the Hotel Novotel Airport, the Hotel Airport Okecie or the Hotel Sheraton Warsaw Center. If you want to extend your stay or want a continuation of the tour, we can provide the best rates for you. (Favorite extension could include Lublin, known a Poland's Jerusalem; Poznan, one of Poland's most historic cities; Kazimierz Dolny, a renaissance trading town; the Bialowieza forest where you can find bison and spa hotels. Distances: 1950 km/ 1209 miles. Max group size - 25 people.